Electronic Manufacturing Services from ViCOS fit like a glove when it comes to supply security, variant management and quality management in electronic production. Innovations of tomorrow. With new products being mass-produced all the time. Together with customers in long-term partnerships. We capture the imagination with our professional electronic production, from prototyping to pilot production to mass production. We specialize in small and medium batch sizes of pluggable printed board assemblies and devices in a great many versions. We handle large volumes in the areas of lighting and building automation. We analyze manufacturability and production costs as early as the prototyping stage. We work together with Development to optimize the lead-up to the prototype. The ViCOS initial prototype test report is the relevant quality assurance tool. We draw up quality control plans (QCP) to accompany production at an early point and implement the entire test environment, based on our automated testing systems. Our production equipment is programmed, and the automated optical inspection (AOI) undergoes initial training. The mass production release includes all production data as well as the test environment and completes the transfer to mass production at the end of the pilot production phase. Each mass production batch starts with an initial part release. We use our automated testing systems to monitor intermediate results based on AOI and QCP as well as the functionality of the finished assemblies and devices. In the process, we measure radio and ultra-low currents as well as high capacities and insulation requirements of mains-powered devices. We carry out a burn-in to prevent early outages and dark phase tests to identify leaks in individual components in solar-supplied devices. All relevant results are stored in our ViCOS test database, so that they are available at any time. On request, we pack your products individually, print instructions, add them to the packages and label them according to your requirements. We ship to specified delivery addresses in your name, both within Europe and for export worldwide. Investment goods require updates and upgrades from time to time. We carry them out for you and offer the necessary service logistics. We repair defective assemblies and devices even after many years. We understand that investments must provide an operating time of 10 years or more. Discontinued components are the enemy of mass production. We monitor these components and stock them as needed with your approval. We maintain proper storage, if necessary in a nitrogen atmosphere. Working closely together with you, we manage the seamless transition to replacement products and offer an active phase-out process to minimize discarded materials. This approach saves resources and avoids unnecessary costs. The expertise of our employees ensures the quality of our products and services. Our employees offer suggestions for improving our workflows directly from their daily activities. Everyone at ViCOS feels responsible for the quality of our products and for the resulting customer satisfaction. 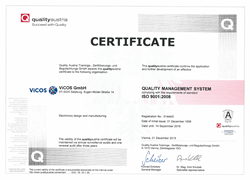 ViCOS has been an ISO9001-certified company for many years. We internalize our processes and make use of tools for continuously improving quality. We avoid predictable errors by constantly analyzing and adjusting our workflows. Furthermore, we consistently document our quality parameters and carry out meaningful reporting.